Today the village elders in Diafarabé set the date for the annual cattle crossing for Saturday! 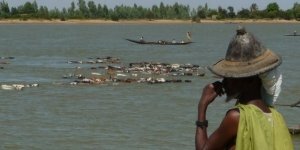 A unique event of the Fulani people, during which the herders swim with their herds to cross the Niger river. Join our three-day trip by pinasse on the Niger river and attend the Great Cattle Crossing.